88 ha of beautiful Parkland Golf in the Tirolean Alpen Countryside. Want to improve your short game? there is no better place than the challenging 9 hole ‘pitch & putt’ Kaisergolf. The course is on a slope, has water, is surrounded by forest, and has relatively small greens, so you will require a precise game to achieve a good score. The Wilder Kaiser region is a hiking paradise, with a remarkably diverse selection of trails for you to discover. With idyllic valleys, rolling grassy hills and imposing mountains, plenty of scenic charm is guaranteed. The variety of tours is huge, and can be combined to suit your needs and ability. Discover the fun of hiking on and around the Wilder Kaiser, going from hut to hut with overnight stays. Follow the Adlerweg (Eagle Trail) or the pilgrims along the Tyrolean St James route. It is safe to say the three day hiking tour on the south side of the Wilder Kaiser is one of the most beautiful hikes in Tirol. Established in 2007, Scheffau am Wilden Kaiser is the “1st Kneipp for me® village in Tirol” and invites you to experience the seven relaxation and healing stations along the Kneipp-walking trail. The steep rock faces of the Kaiser mountain range make it the ideal place for all climbers and mountaineers. The region offers alpinists mountaineering, alpine climbing, sport climbing, and ice climbing on frozen waterfalls. Climbing courses are available for beginners through to advanced. 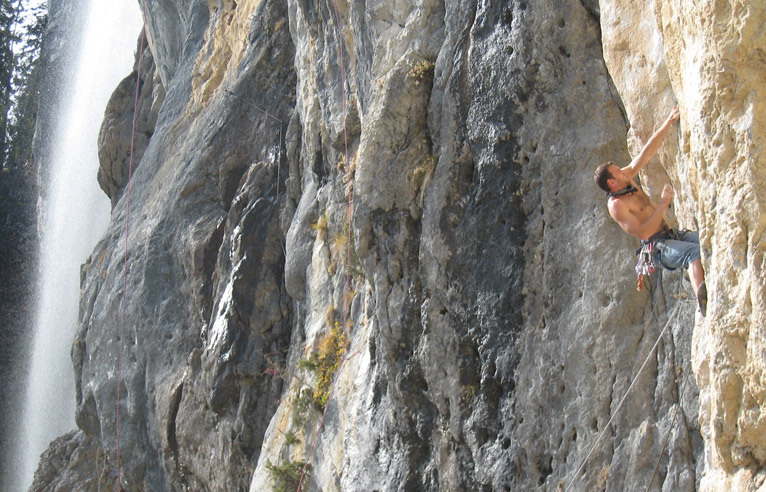 Highly recommended are the numerous sport climbing routes around the “Achleiten” and “Schleier Waterfall” many of which have been developed by the famous Bavarian climber “Huber Buam”.